Five Days Left to Help Participate & Find a Cure for Celiac Disease! We’ve also partnered with wonderful Glassybaby and their Power of Giving campaign. Glassybaby is a private company based in Seattle, WA founded by award winning entrepreneur Lee Rhodes. Its primary product is a handmade, gorgeous, one-of-a-kind glass votive also known as a ‘’Glassybaby," produced in more than four hundred colors and sold over the internet and through retail stores in the Seattle area and San Francisco. 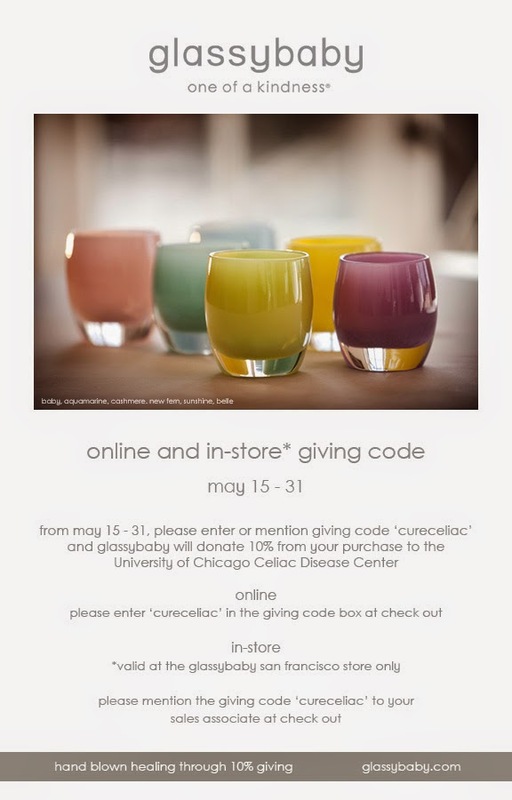 Visit Glassybaby.com from May 15-31 and enter 'cureceliac' in the giving code box at check out to donate 10% of your purchase towards finding a cure. Use the same code, 'cureceliac,' for in-store purchases, as well. National Celiac Awareness Month Kicks Off with Croissants for a Cure! 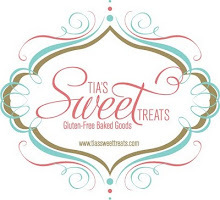 For the second year in a row, we've partnered with the fantastic Mariposa Baking to promote National Celiac Awareness Month and raise awareness throughout the Bay Area and beyond!! And don't forget to #glutenfreemay with your favorite recipe created with their newest croissant and/or sandwich batard. The chosen winner will receive a gift certificate to Mariposa Baking! Mariposa Baking of Oakland is again partnering with The University of Chicago Celiac Disease Center for National Celiac Disease Awareness Month in May. This unique partnership, formed through a strong desire to generate more awareness of celiac disease on the west coast, brings together the Bay Area’s preeminent 100% dedicated gluten-free bakery and a world-renowned leader in celiac disease research. Throughout the month of May, Mariposa Baking’s retail locations (Oakland and SF) and online shop will offer their customers the opportunity to participate in this fundraiser. A portion of Mariposa’s May sales will go directly towards funding research at The University of Chicago Celiac Disease Center. Mariposa Baking is highlighting its newest pastry, a delicious butter croissant and newest bread offering, sandwich batard, which can be purchased in their retail locations, online store or by mail order. May is National Celiac Disease Awareness Month. The focus is to raise awareness about celiac disease and non-celiac gluten sensitivity (NCSG). Approximately 3 million Americans have celiac disease. There is no evidence-based data to indicate how many have non-celiac gluten sensitivity. For more information about this event, details about this partnership or celiac disease, please visit: www.mariposabaking.com. 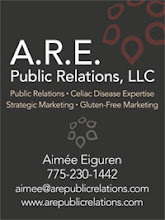 For information about The University of Chicago Celiac Disease Center, please visit: www.cureceliacdisease.org. The University of Chicago Celiac Disease Center seeks to cure celiac disease. It is an international center of excellence providing comprehensive patient and professional education, expert diagnosis and treatment for both children and adults, groundbreaking bench and clinical research, and active leadership in advocacy efforts. The Celiac Disease Center is part of the University of Chicago, a 501(c)(3) nonprofit organization completely funded by donations. Our start was simple. Patti Furey Crane, Mariposa’s founder, craved high-quality sweets while pregnant with her first child. Finding few options at the time, she set out baking them herself. And so, in 2004, Mariposa was hatched. Mariposa’s mission – create wholesome, hand-crafted food using the finest natural ingredients. Our certified green bakery also houses our first retail bakeshop. 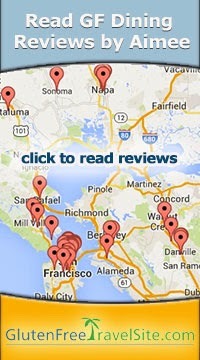 We have two storefront locations, our Oakland Bakeshop and our new SF Bakeshop, est. 2012 and located inside the Ferry Building, where we’re able to bring daily bread and hand-crafted sweets to San Francisco’s gluten-free community. We have an online store for customers outside of the Bay Area, distribution to natural foods stores on the West Coast and we service many local restaurants with our artisan breads and pizza crusts. We have a passion for- the baked goods we make, the creative journey we’re on, and the communities we serve. A Bowl of Soul warms your heart and reminds you to be thankful for the abundance in life - and it's gluten free! Enjoy my little life's journey and some tasty tid-bits along the way.